High Success Rate IN TREATING FROZEN SHOULDER IN JUST ONE VISIT. I’m a board certified family physician and have worked as a primary care medical doctor both in New York and in Southern California. Then I suddenly became a miserable, suffering patient with two frozen shoulders–the left shoulder for around 6 months, and right shoulder for the past 2-1/2 months. Having the Trigenics OAT non-surgical operation performed was the best decision I ever made. Watch her video testimonial! In my capacity as a duly qualified medical physician, I have witnessed excellent results with numerous patients who have undergone Dr. Allan Oolo-Austin’s Trigenics non-surgical operation for adhesive capsulitis frozen shoulder. All of these patients had attended numerous treatment sessions with various health practitioners and/or therapists with little or no results. See More Testimonials! As a medical rheumatologist, I have seen numerous patients with adhesive capsulitis frozen shoulder, with less than satisfying treatment results. A friend of mine who suffered from frozen shoulder for one year, had asked me to attend her OAT Procedure. 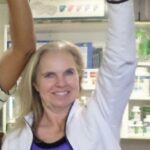 After less than an hour of non-invasive manipulation of her shoulder with Trigenics Myoneural Techniques, my friend could lift her arm up above her head (see picture). There were also 3 other patients there who had undergone Dr. Austin’s OAT Procedure for frozen shoulder the day before. They also showed the same outstanding results. See More Testimonials! 45 minutes after the OAT procedure and with no surgery, magic happened! 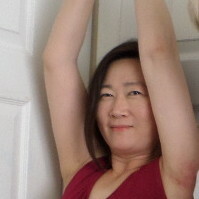 I could raise my arm above my head and regain functional range of motion. Dr. Austin is for real, he actually cures frozen shoulders. While I was at the Trigenics clinic, a constant flow of patients were coming from all over the world for treatment of their frozen shoulders. Everyone who had the OAT non-surgical operation came out with big smiles moving their affected arms. It was overwhelming to watch. Thank you Dr. Austin for taking care of me and giving me my life back. See More Testimonials! probably tried a number of different therapies, nothing has worked and now your shoulder pain and immobility is having a tremendous impact on both your quality and outlook on life. I want you to know that you’re not alone and that there IS hope for you. As you probably already know, The OAT Frozen Shoulder Treatment is renown around the world for its exceptionally high success rate and our ability to unfreeze your shoulder in truly JUST 1 Visit. Now, we know that given your previous experiences, our claims sound unbelievable and simply too good to be true, but if you watch our testimonial videos and see the results that we’re able to attain, you’ll realize that our clinic will probably provide you with the results that you’ve been desperately seeking. We Are Very Selective As To Who Accept For Care: As you might imagine, it’s virtually impossible to heal every single patient that comes to our office with frozen shoulder. However, to increase the likelihood of correcting your frozen shoulder, we follow a strict patient qualification process to ensure that if you’re a candidate for our treatment, you will have the highest probability of treatment success. Our OAT Frozen Shoulder Procedure Is Specific To Your Condition: Because no two frozen shoulder patient are the same and in order to achieve our level of success and your desired results, our OAT Frozen Shoulder Procedure will be performed with precision based on your shoulder’s exact specifications. As a result, not only are we able to remove your frozen shoulder in just 1 treatment, but you can start enjoying you life again the next day. Book Your Free Frozen Shoulder Phone Consultation With One Of Our Frozen Shoulder Educational Directors Today!